Teen-Beat 176. 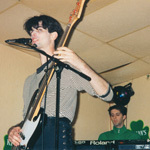 Teen-Beat Night at O'Carroll's Irish Bar & Restaurant. 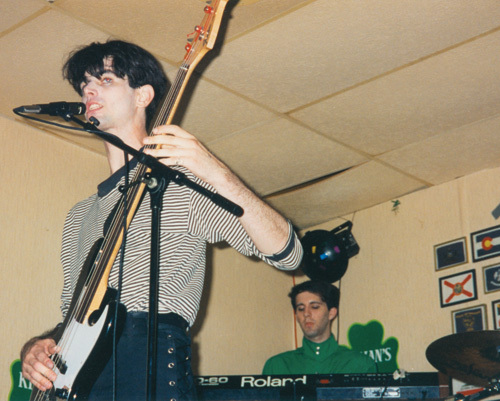 A series of concerts and performances held at O'Carroll's Restaurant in Arlington, Virginia. Admission was always free. Artists that participated either recorded for Teen-Beat or were pals of the label. Mark Robinson curated the nights and put the bills together while John Fox booked the shows with the restaurant. Seven shows were scheduled over the course of 15 months and six of those took place. Teen-Beat Nights numbers 4 and 5 were a part of Teen-Beat's Tenth Anniversary Celebrations [Teen-Beat 173]. 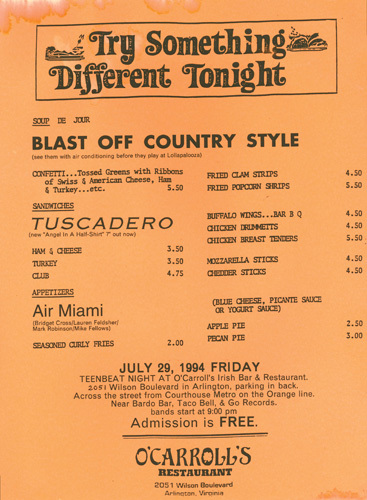 No.1 BLAST OFF COUNTRY STYLE, TUSCADERO, AIR MIAMI. July 29, 1994. No.2 CHISEL, CATERPILLAR, GRUBBY. September 2, 1994. No.3 THE ROPERS, LORELEI, JONNY COHEN'S LOVE MACHINE. December 23, 1994. No.4 AIR MIAMI, ROMANIA, BUTCH WILLIS, [Cath Carroll cancelled]. March 2, 1995. No.5 TUSCADERO, VERSUS, UNCLE WIGGLY. March 3, 1995. No.6 TEL AVIV, ROMANIA, PUMPERNICKEL. July 22, 1995. 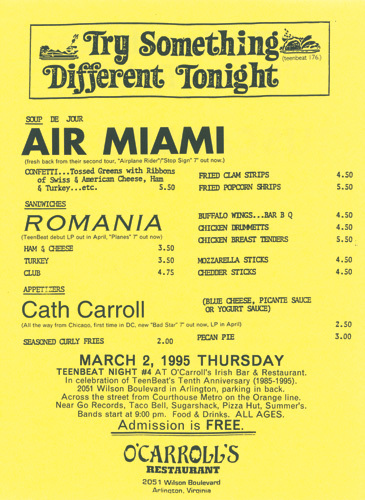 The flyers for the show are based on O'Carroll's menu. 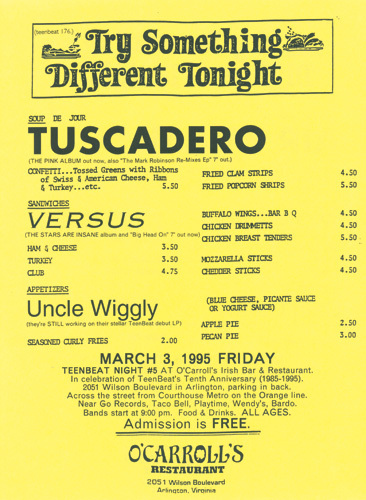 Some of the menu items were obscured with the band names, but most of the flyer was a usable menu. The headliner was always the "Soup du Jour", the opener was the "appetizer," while the band in the middle was, of course, a "sandwich." Cath Carroll was billed to open show number four, but cancelled. Butch Willis performed in her absence.